The Siwi language is usually considered to be a variety belonging to the oriental group of Berber languages together with the Libyan varieties of Ghadames, Sokna, Awjilah and El Fogaha. Several voyagers and scholars have already collected data on Siwi, but their publications are either out-of-date or restricted to specific problems. The author managed to give us a book which no doubt deserves to draw the attention of all those who have an interest in Berber languages and culture in general or in North Africa as a whole. Linguists, in the first place, will appreciate having a simple and clear grammatical survey and long texts in a single volume. Siwi has undergone an important evolution and adopted new features, but at the same time it has kept ancient ones, which makes it even more interesting. The richness of the data will help comparing Siwi with the other ‘oriental’ dialects of Berber and decide whether or not they can be viewed as a subgroup. In Siwa storytelling has always been the domain of women, at least in the past. Traditionally the storyteller sat on the floor on carpets and pillows and was often surrounded by children, however adults were not excluded. The aim of the stories was not only to entertain children but also to hand down a pedagogical and instructional message. Many people have confirmed that this kind of ritual has now almost completely disappeared, mainly because of television which has replaced the women’s role of entertaining and teaching children. 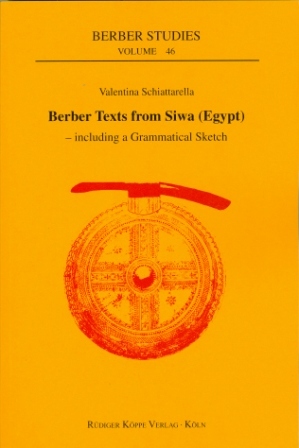 This volume is divided into three parts: the first one is a short introduction to the Siwa oasis; the second one is composed of a sketch grammar of Siwi which is meant to help the reader to acquire basic grammatical knowledge on the language. The third part is a collection of nineteen texts: four descriptive narrations, fourteen tales and some riddles. Most of the texts present the Siwi version on the left and the English translation on the right. The last five texts are morpho-syntactically glossed and translated: they are intended to initiate the reader to the structure of Siwi Berber. Due to its large success, this text collection appereared in a second, completely revised edition in 2017.